Tonight is your last chance to win a seat in the BBT4 in a game that is NOT No Limit Hold'em. And only the Mookie, Brit Bloggament, and The Big Game left after tonight. Good luck to everyone, as tonight it Seven Card Stud. Next week is 7 card Stud hi. See you on the felt. Skillz Game Limit Hold - LJ Wins!! My hope of winning this one was dashed when I finally got knocked out in 5th place, which is much higher, or much lower, then I should have finished, depending on if you think my sucking out was good, or others sucking out was bad. I thought I had a real shot until Smokkee stated pushing me around with his larger stack, and LJ went on a heater on the final table. Too tired to have done the stats, will update them tonight or tomorrow! No Mookie for me tonight, but you can bet I will be at the Big Game! Limit Hold'em tonight, quite possibly my best chance at a BBT4 seat. Already 12 people signed up as of 12 Noon, so I hope we have a big turn out. Between being on vacation and being sick, I am really behind. Therefore there are NO screen shots of the last two weeks Top 14. However I am happy to say that High on Poker won Pot Limit Omaha on May 5th, and heffmike won the H.O.R.S.E tournament on May 12th. 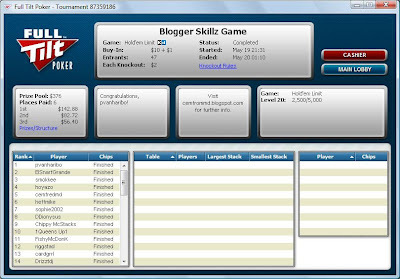 This was heffmike's 2nd Skillz Game win this year, and jumps him past NumbBono into 1st place overall on the Skillz Game Leaderboard for 2009, and the first player to have earned over $300.00 this year. Next week is Limit Hold'em, which I will be playing at the WSOP this year, so hopefully I can work on my game some during the tournament, much like I have on PokerStars at the 9 PM $4.00 tournament. Hope you all make it tonight, I probably will not, as I feel like crap. But hey, I am signed up, so if I dont make it, FREE CHIPS!! Sorry everyone, I took off on a golf trip on Wednesday without having a chance to update the stats. The information is at home, so I will update Saturday once I get home. Have a great week everyone! Another Tuesday night, another Skillz Game. Another chance at a BB4 TOC seat. Good luck to all, see you on the virtual felt tonight.